This week was about Love. I attended the production of Jesus Christ Superstar in Vernon and then watched the Royal Wedding and came away deeply moved by both. JCS was a big part of my teenage years, the songs were imbedded in me and now 40 something years later I was struck by their continued relevance and the power of shining light on the human struggle to be authentic and real as the world seems to be other than that. The Royal Wedding presented itself in a similar vain. Their was an acknowledgment that even in the powerful position that these people embody and because of it, you can be a force for good and “love”. Society, families, and culture change when we choose to be aware that how we think, act and love makes a difference. As I considered all this while planting in my garden and thinking about the summer to come, I thought about the power of knitting. 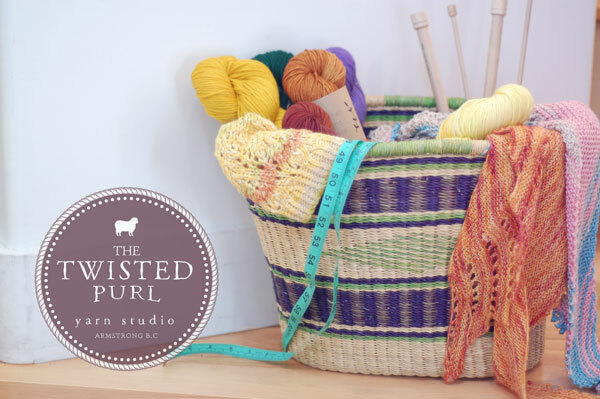 Not only has knitting been a personal creative experience for me, in the last few years since opening The Twisted Purl, I have been really impacted by the experience of teaching people how to knit. Not only was it a business decision, teaching people to knit shone light on my way of being, communicating and ultimately being in community. So just as we can live insular lives knitting for ourselves, for our favourite charity or family, teaching someone else to knit with the clear intention of passing on the skill, the passion and the love is just as important. So for all of you lovely knitters out there I respectively request that you begin to share the love. Teach someone to knit this summer as if knitting really mattered. Spend time thinking about how to communicate the intricacies of making each stitch and how it can be translated to your student in a way that shines a light on who they really are and how they can express their creativity with the amazing art of Knitting. There are sons, daughters, grandchildren, friends, nieces and nephews and even spouses that would thrive on the connection that will be created. So this summer instead of just Knit One, Lets Knit Two.